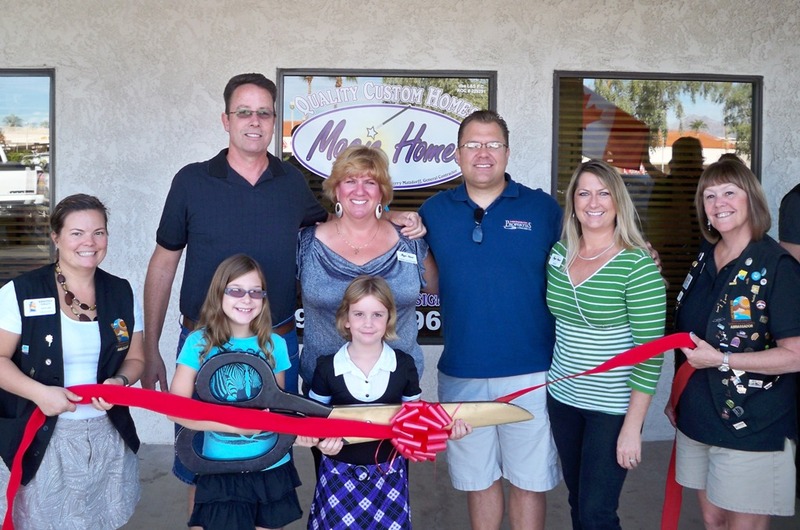 The Lake Havasu Area Chamber of Commerce Ambassadors held a ribbon cutting for Magic Homes, LLC located at 2181 Smoketree Avenue. Magic Homes is Lake Havasu City's first Energy Star home builder. Magic Homes builds homes throughout Mohave County Including Lake Havasu City, Kingman, Yucca, Pioneer Valley, Golden Shores, Golden Valley, Bullhead City, Fort Mohave, and Valle Vista. Their homes meet the strict energy efficient guidelines of an energy star qualified home. On hand for the ribbon cutting from left to right in the back row are; Chamber Ambassador, Kristina Gallo, Lance Matzdorff, Sherry Matzdorff, Dean Baker, Jody Robertson and Chamber Ambassador, Kathie Schuler. Located in the front row from left to right are; Miss Miley Robertson and Miss Rachel Matzdorff. Magic Homes can be contacted at 486-9660.